(CNET) -- Well, here's what we've all been waiting for. Apple put out a couple of announcements on Tuesday related to its desktop computers. Apple on Tuesday announced a new Mac Pro high-end desktop powered by Intel's "Nehalem" processor. The company unveiled a new Mac Pro high-end desktop powered by Intel's "Nehalem" processor, a new and more graphics-intensive Mac Mini machine, and updated iMacs that include the lowest price point yet for the consumer desktops. The new iMac desktop is a 24" machine that is priced at $1,499, the cost of Apple's previous 20" iMac. The 20-inch is now $1,199. The 20" is powered by a 2.66 GHz processor; the 24" has processor speed options of 2.66 GHz, 2.93 GHz (for $1,799), or 3.02 GHz (for $2,199). The 24" comes with a 640GB hard drive and 4GB of RAM expandable to 8GB; the 20" comes with a 320GB hard drive and 2GB of RAM expandable to 8GB. "Our flagship 24-inch iMac with twice the memory and twice the storage is now available for just $1,499," Apple chief operating officer Tim Cook, currently standing in at the helm of the company in place of iconic CEO Steve Jobs, said in a release. "The Mac mini is not only our most affordable Mac, it's also the world's most energy efficient desktop computer." As for the new Mac Mini, the big upgrade is NVIDIA GeForce 9400M integrated graphics that Apple says will improve its graphics performance as much as fivefold. The monitor-free machine costs either $599 for a lower-end edition (1GB RAM, 120GB hard drive) or $799 for the higher-end (2GB RAM, 320GB hard drive). All these machines, like the new Mac Pro, meet Energy Star 5.0 requirements. 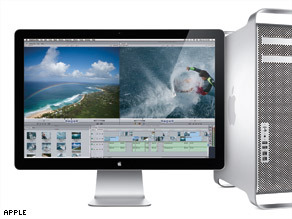 Rumors of new Apple desktop computers were first reported at AppleInsider.